Ghost is a free, open-source professional publishing platform for making blogs. The main idea behind Ghost is to make a simple blogging platform without those extra un-used features. 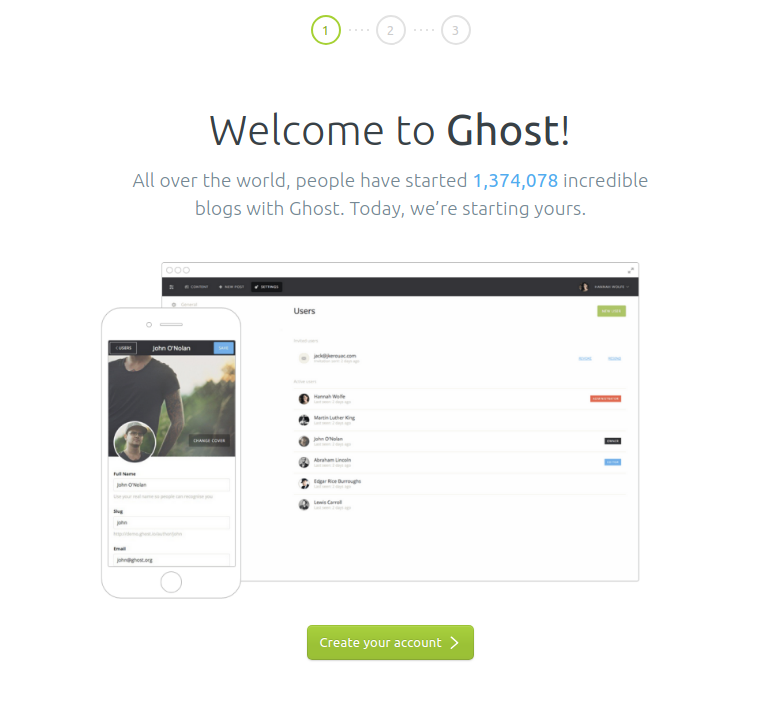 If you only want a simple blog which has a well-designed interface and is fast, go with Ghost. If you want something complex like an eCommerce site or something like that, then It’d be better to go with WordPress. Ghost uses Node.js for the back-end. This is the reason It is very fast. More on Ghost vs WordPress here. Starting a Ghost (pro) is very simple. You just have to visit the website, make an account, pay the price (there’s a 14-day trial as well) and your blog will be ready. For a self-hosted version, you’ll need a server. You won’t be able to run Ghost on shared hostings as most of them don’t allow Node.js. Your best bet would be to get a $5 VPS from DigitalOcean or Vultr or Linode. This option would be cheap and great in performance. If you signup with DigitalOcean using this affiliate link, you’ll get $10 in DigitalOcean. DigitalOcean also provides Ghost as a one-click installation application. So you can just start a server, choose Ghost from one-click apps and your blog will be ready. For the sake of this tutorial, we’re going to use Vultr. You can use any of the above mentioned VPS providers. Everything will almost be the same. Sign up for an account on Vultr. Choose servers from the left menu and then click on the ‘+‘ sign. Then choose the server type Ubuntu 16.04 in Server Type. I chose 64 bit OS. Enter anything in server hostname and label and click Deploy Now. If you want to apply a domain to your new blog (I’m sure you will) then point your DNS to Vultr. Go to your Domain Registrar and point your domain’s nameserver to Vultr’s. Click on Servers in Vultr, then choose DNS. Now click on Add Domain. Enter your domain name and your server IP address (the server which you created in the first step). Click Add and your domain will be added to your server. Now we need to SSH into our server and run some commands to install everything required. Copy your server IP address and open terminal and paste the following in the terminal. Replace X.X.X.X with your server Ip address. The password to log in as root is available on your server setting page on Vultr. If you’re using Windows, you can also use PuTTY to SSH into your server. First of all, let’s create a new non-root user. Run the following commands on your server. Make sure to replace omer and Omer Iqbal with your username and Name. adduser omer --gecos "Omer Iqbal"
The first command will add a user with the username “omer”. --gecos will ensure that It won’t ask you further questions like Phone number etc. Run the following command to install build-essential package. It contains references to many tools like gcc compiler etc. which are needed by some npm packages. Next, we’re going to install MySQL and Nginx on our server. While installing, It’ll ask you for the root password. Enter a strong password and remember It. We’ll need it while installing Ghost itself. Ghost official server requirements recommend >=6.9 <7. * (Node v6 boron LTS). Although node version >=8.9 (Node v8 carbon LTS) is also supported. Click here to check out Node supported versions by Ghost. Now we’ve successfully installed Node.js and NPM. 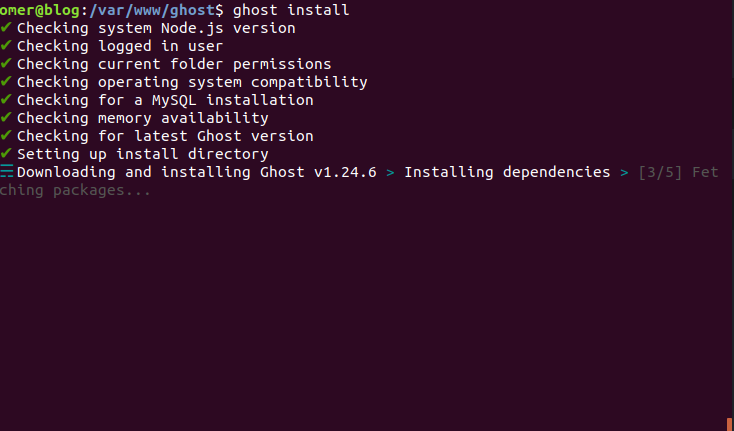 We’ll be using ghost-cli to install ghost on our server. It is the official program and configures everything for us. This will install the latest ghost-cli globally (-g). Make sure to replace omer with your own username. Run the following command to give your full permissions to your user and read/execute for everyone else. It’ll start to download and install Ghost for us. After that, It’ll start asking us some questions. Answer them according to your needs. It is up to you whether you want to set up SSL or not. It is recommended and I’ve set It up. Ghost is now installed and running. 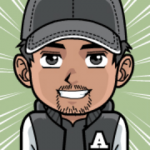 Visit https://example.com/ghost to configure your user and start using your new blog.